Professor Tetlock, who’s based at the University of Pennsylvania, famously did a 20-year study of political predictions involving more than 280 experts, and found that on balance their rate of accuracy was little better than chance. In November 2007, economists in the Philadelphia Federal Reserve’s Survey of Professional Forecasters predicted just a 20 percent chance of “negative growth”—read: decline—in the U.S. economy any time in 2008, despite visible signals of an impending recession. The data shows humans are terrible at predicting the future. A product manager is a human. 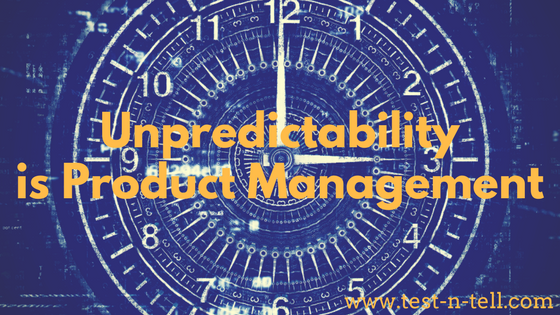 Therefore, product managers are not much better at predicting the future. And yet! Product managers are expected to be time travellers. What would our competitors do? How would the economy be like? Would R.R. Martin finally finish the new "Game of Thrones" book? Yeah, we're not sure. Our chances to predict are as good as any other's. Moreover, when we are sure - something is wrong. We might do something obvious and therefore pointless. Not only our predictions are wrong. They're wrong in a particular way. Too optimistic. Unrealistically optimistic. And no wonder. We're heavily invested in the outcome of our work. We really want that release to happen on time. Really want them to buy. And really want to read that next book. That's why it's borderline impossible to avoid the confirmation bias. To find that bits of data that support our predictions. If not the knowledge of the future - what are we bringing to the table? The techniques to react. To adapt. To quickly evaluate the reality and act accordingly. A good system is characterised not by the absence of mistakes but the reaction to mistakes. Good PMs could react efficiently to an ever-changing reality. React in the spectrum between despair and arrogance. The principle every good PM learns: don't panic! even if your hat is on fire. Humble. Don't think you are much better than everyone else. Lean. When you control 52,310 tons ship and see an iceberg, you might not be able to avoid the crush. Receptive. You need to be continually looking into the darkness of the future. Only be being self-aware, fit and sensitive we could deal with the surprising tomorrow. Still, no excuses for not trying your best. You should never be that certain about your own beliefs—the world just doesn't work that way. You have to be more adaptive, you have to be more reactive. You have to think probabilistically rather than in terms of certainties. It's not that you are always going to be right, because you are going to make mistakes no matter what, but you might be less inclined to make catastrophically bad mistakes.